If you are familiar with bats then you are also familiar with bat hype. There is very little data comparing one bat to another by way of performance. In addition, marketing hype gives little hope when getting to the bottom of this oft asked question: What is the Best Bat? 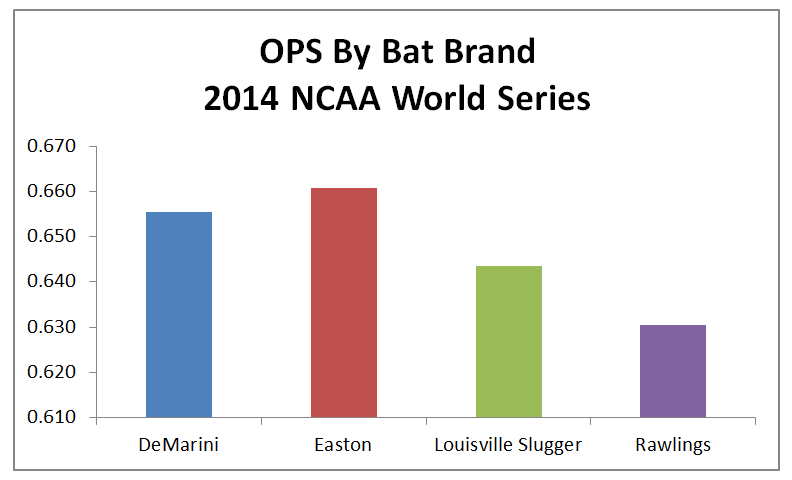 Now that the 2014 NCAA World Series is over, and we’ve been able to track the progress of each bat brand during the entire tournament, we can at least have some objective evidence when considering the best bat of the 2014 NCAA World Series tournament. We’ve compiled the data per team, taken out the teams which use multiple brands (which aren’t many due to sponsorship), aggregated their stats by bat brand and made some comparisons which we think are noteworthy. For Starters there were 10,199 plate appearances (PA) and 9,273 at-bats (AB) by, roughly, four different Bat Brands: DeMarini, Easton, Louisville Slugger and Rawlings in the entire tournament. There were 2,340 hits (H) (for a 2014 NCAA World Series Tournament batting average of .252). These PA entailed 926 walks (BB), 363 doubles (2B), 55 triples (3B) and 86 home runs (HR). More Teams were swinging DeMarini in the Tournament. Further, teams that swung DeMarni advanced further in the tournament. Of the 49 teams in the tourney which have exclusive bat contracts, 22 of them were DeMarini. Those 22 teams make up 37.9% of the total teams yet DeMarini made up 39.2% of the plate appearances. 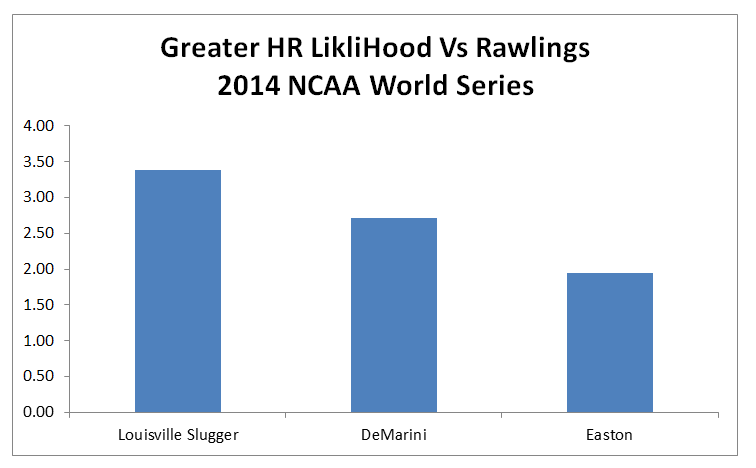 Rawlings, on the other hand, put 20.7% of the teams in the tournament and only played 19.4% the amount. In other words, it can be argued, swinging DeMarini in the 2014 NCAA world series gave you more chances to hit the ball than any other bat brand. It turns out, as well, that Vanderbilt, who won it, swung DeMarini. Giving us another reason to award DeMarini with the bat in the NCAA World Series Tournament that gave teams the best chance to advance. 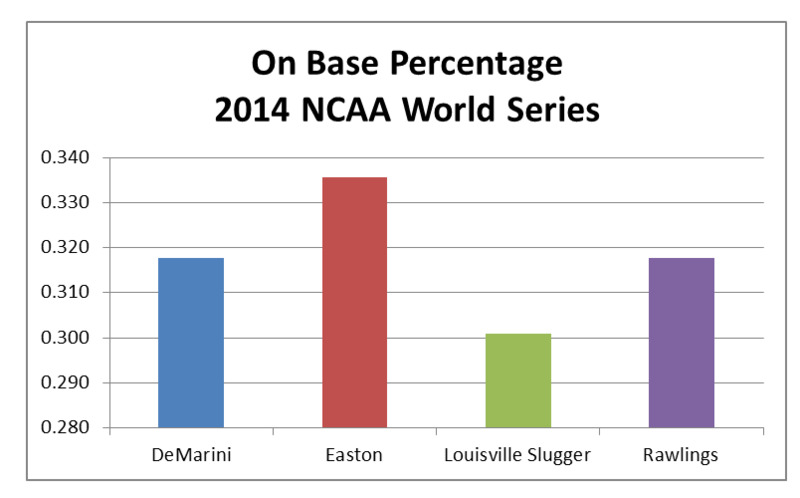 DeMarini leads well in front of the other four, rounding out at 39% of plate appearance in the 2014 NCAA World Series. Lot’s of CF6, Overlords, Paradox and what we thought were some Insane. 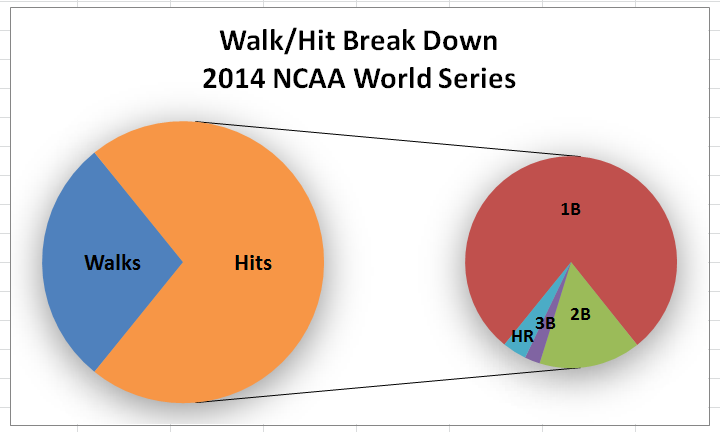 Rawlings also received a lot of play at the plate in the 2014 NCAA World Series. About 1 out of 5 times, the batter’s box had in it a Rawlings bat. The Trio, 5150, and Velo were most common. We were also pretty sure we caught a glimpse of the Rawlings Machine at the plate. Easton was 19% of plate appearences with the MAKO, XL1, and S1 getting tons of chances to prove their worth on the highest level of aluminum bat play in the world. Our eyes may have deceived us once as we were sure we saw the 2015 MAKO Torq at bat at least one time. Louisville Slugger came in at 22% of plate appearnces. The Attack andRAID were commonplace at the plate. There were a couple of hitters where we thought for sure we saw the new 915 Prime. 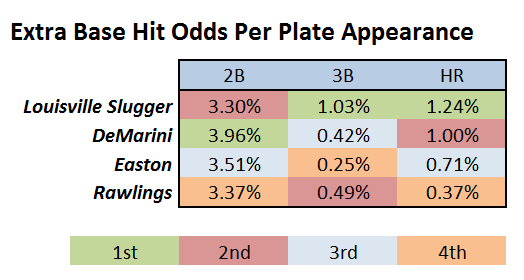 Per Plate Appearance, Louisville Slugger bats were the best for hitting extra base hits. While second place on hitting for doubles (behind DeMarini) LS was more than twice as likely to hit a triple and roughly 1/4 more likely to hit a home run compared to its next closest competitor (Rawlings and DeMarini respectively). *Weighted odds give 2B 2x the weight, 3B 3x the weight and HR 4x the weight. Not only did LS hit more extra base hits, they hit more extra base hits with greater efficacy. Compared to others, they turned doubles into triples and triples in home runs. 12.5 out of every 100 at bats were a home run for LS. DeMarini was 10 out of 100, Easton just shy of 7 per 100, Rawlings with under 4 home runs per 100 at bats. 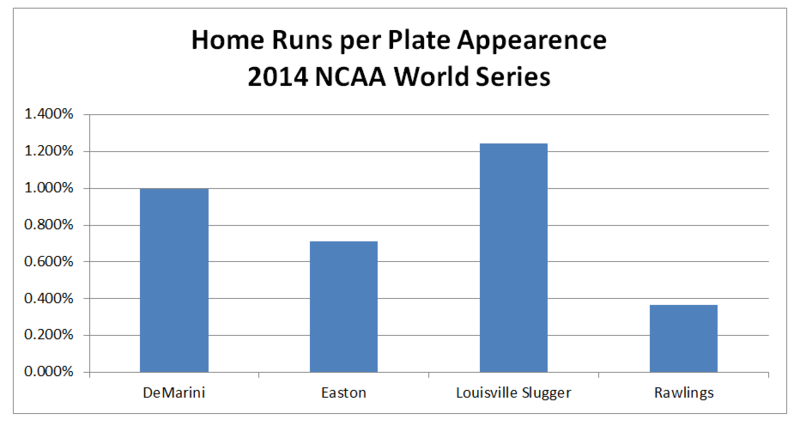 Maybe as interesting as Slugger’s dominance in the dinger department is Rawlings unimpressive performance when measuring extra bases by bat brand in the 2014 NCAA World Series. Rawlings had a marked difference in home run ability than their competitors. Players swinging LS were almost 3.5 times more likely to hit a home run when compared to Rawlings. In this same vein, Louisville Slugger also had the best Slugging Percentage by bat brand. Clearly those teams who swing Louisville Slugger are also the teams who hit the ball hard. Is that because of the bats or the LS hitter’s mentality when compared to other bat brands or just a perfect anomaly? Who knows. But this much we can say with certainty–if your team happened to swing the Louisville Slugger in the 2014 NCAA tournament you were much more likely to hit for extra bases. This begs the question as to why? Well, we don’t know. But we are observing it. 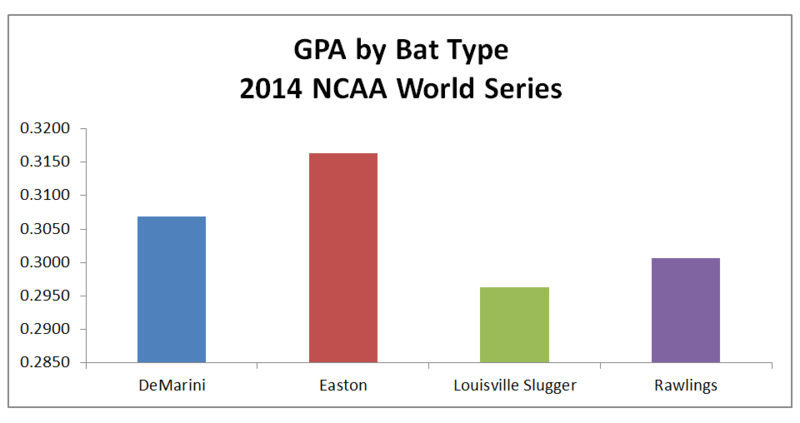 Maybe those who tend play at Schools who choose Easton as their bat also tend to have more patient hitting approaches. That seems far fetched and quite random if true. Maybe, another guess might be, what if the swing weights in the S1, in particular, allow for more contact. More contact might allow for more foul balls, which translates into higher quality at bats and, ultimately, walks. Maybe? This idea would bring down their extra base hits or slugging percentage as we’ve already proved because the S1 has a lower swing weight. Of course this doesn’t account for the XL1 which has plenty of end load. Regardless of the reason, it is fun to point out and try and decipher why in the world those who swing Easton tend to walk much more often than others in the box holding a different bat. Quite frankly, Rawlings didn’t win very many bat awards this year in the tournament (although Virginia, the team who lost in a great effort to Vanderbilt, does swing Rawlings). The bat (or its hitters) struggled to get the ball out of the park or their hitters on base. 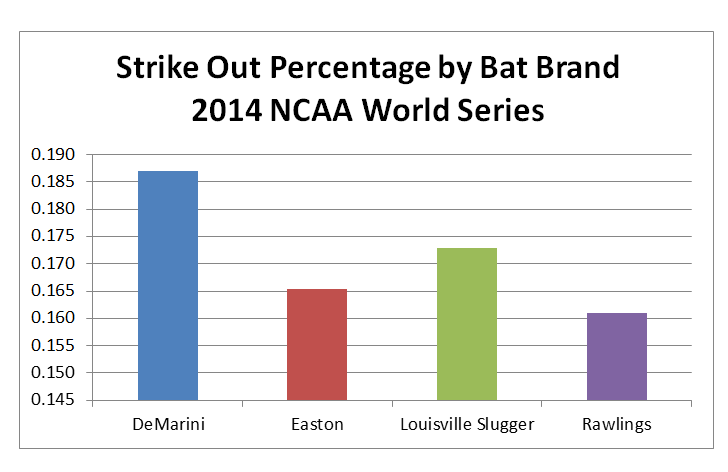 However, for whatever reason, Rawlings hitters did have the best contact percentage of the NCAA 2014 World Series tourney. 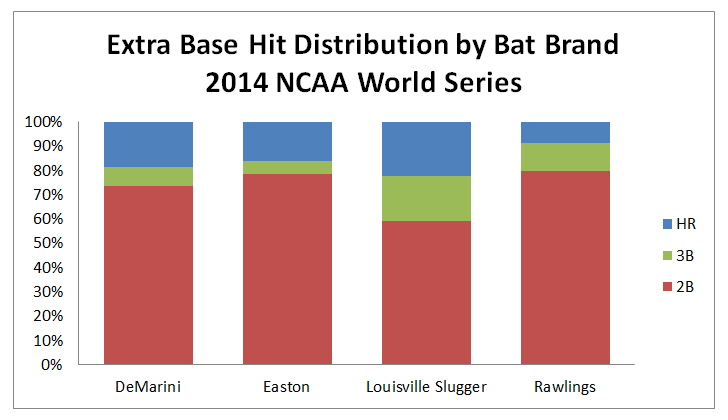 Easton’s line of 2014 NCAA World Series bats stole the efficacy chart. They may not have had the power of the Lousiville Slugger, the tournament depth and championship that DeMarini provided nor the contact prowess Rawlings proved, but when it comes to the hard facts of hitting success, Easton leads the way. 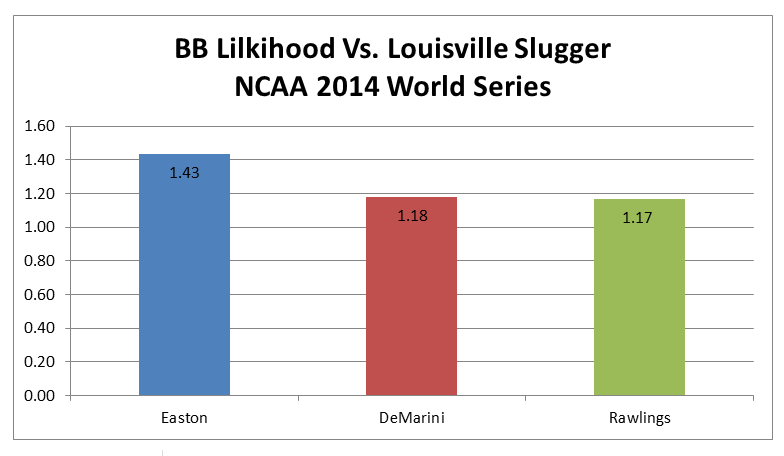 By nearly every measurable statistic Easton was a superior bat in the 2014 NCAA world series. Louisville Slugger definitely hit the ball further but their high end strike out percentage and low walk rate took them out of the running for best bat performance. DeMarini not only got more teams into the tourney but took them further than any other team. Rawlings walked a lot. But from a baseball standpoint, who can argue that Easton’s Power Brigade line of the S1, XL1 and MAKO were not the best bats in the 2014 NCAA World Series? Do Players who swing Easton also happen to be better hitters? Or is it something about the bat? I’m sure everyone will have their spin, but if you want to contend that Easton did not have the best line of NCAA BBCOR bats better really likes the home run capability of the Louisville Slugger line. Previous: Previous post: Was Yoenis Cespedes’ Throw the Greatest?